Keeping up with the medical literature is increasingly difficult. At the current pace, over 1.2 million citations will be added to PubMed this year, which breaks down to more than 304 per hour in an 80-hour work week. To be knowledgeable about recent studies and innovations requires a two-part pull and push strategy: you not only need to be able to dive into the literature and pull what you need when you need it, but you will also benefit from the most relevant information being pushed to you for overall current awareness. There are several options out there including QxMD Read and Docwise. 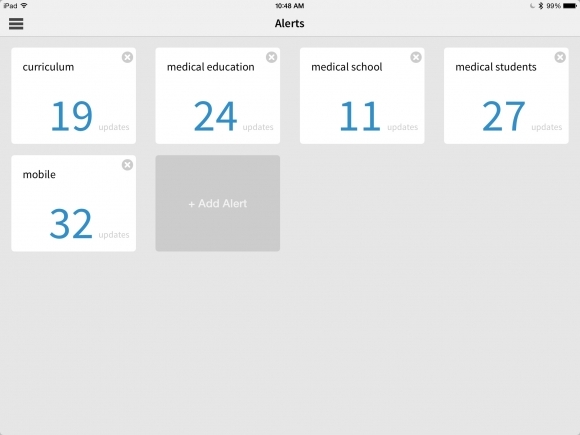 Another handy solution we’ve covered in the past is Docphin; iMedicalApps interviewed Docphin founder Dr. Mitesh Patel back in 2012. For this review, I looked at Docphin on the iPad. While viewing abstracts on a phone-sized screen is acceptable, it’s generally too difficult to read PDFs on phones. Docphin requires users to create an account, which allows for customization in journals followed, specification of topic interests, and enabling institutional access. 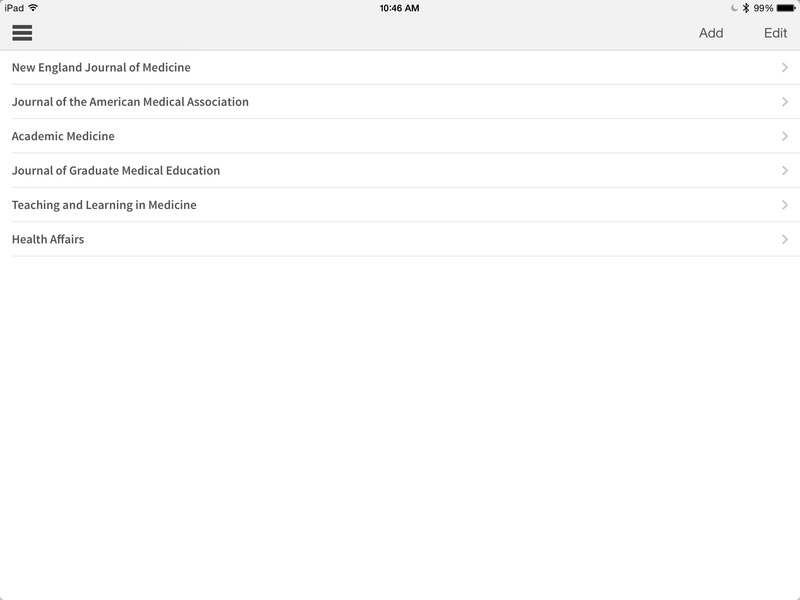 Each specialty comes with a pre-selected list of journals to follow, but you can add and delete titles from this list. There are over 5,000 journals and high quality health news sources (e.g., New York Times, The Atlantic, NPR) to choose from. Most of the journals in PubMed are covered, meaning most specialties and health professions will have relevant journals to follow. The landing screen is called Medstream and this is where new articles from the journals you follow, trending articles on Docphin, recommended articles, and new articles from your alerts are all integrated. Navigation to other sections is available on the left. Viewing abstracts is simple, and these can easily be shared via email or major social networks. Star it to save it into your Saved folder. Viewing the PDF uses your institution’s journal collections and proxy settings. For research journals, Docphin can’t make available something your institution doesn’t have access to. 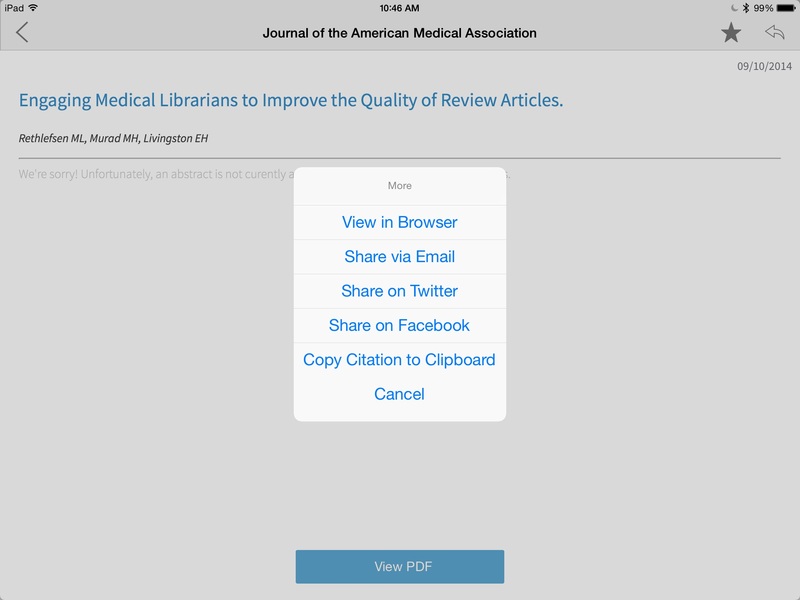 When you get to the PDF, the options and display will depend on the journal platform. 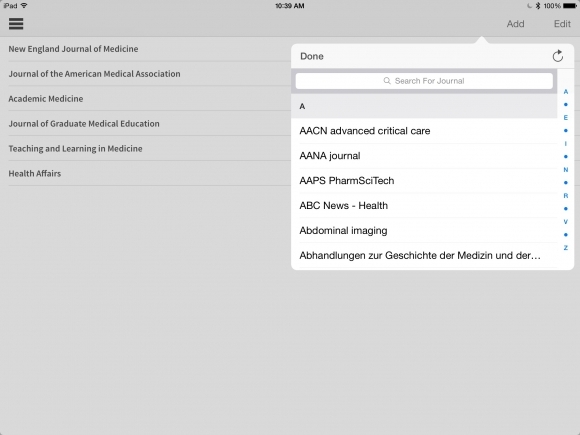 Docphin adds a toolbar at the top to allow you to Open in Safari, Share via Email, or View in PubMed. If the journal drops you directly into the PDF, Docphin will also allow you to Open in Dropbox, offering an easy way to name the PDF and create folders, which is great for managing PDFs in your Dropbox app. Dropbox integration has to be turned on under your settings. Other sections of Docphin offer alternate ways to find articles. 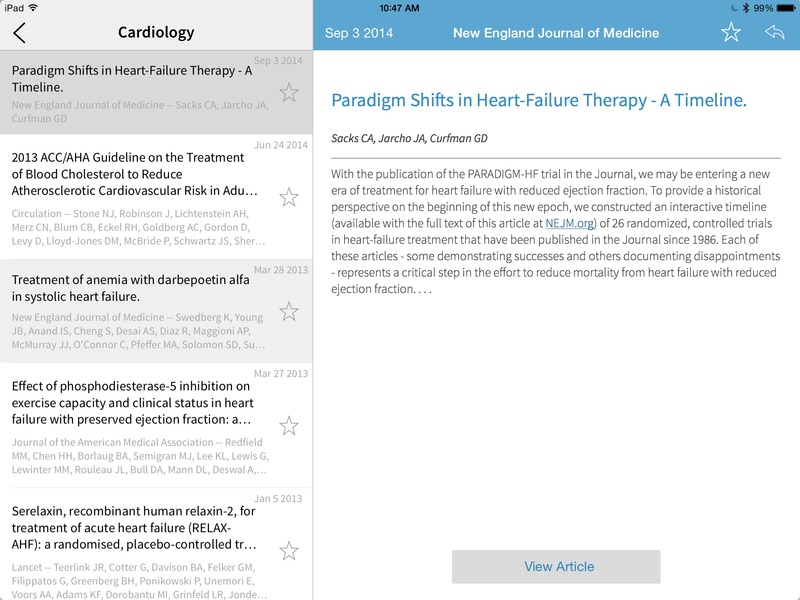 While Medstream integrates new material from a variety of sources, there are times when you might want to browse the whole table of contents from a specific journal you follow. You can do that from the the Journals section. Landmark Articles represent important or foundational articles. These are selected by faculty experts from across the country on an ongoing basis. No selection criteria, list of experts, or schedule of updates is currently available. Currently, landmark articles are available by specialty. Topic collections, including disease-specific topics and collections such as JAMA’s Rational Clinical Examination series, are available to premium subscribers only. Recommended articles are selected for users by an algorithm that looks at their saved articles. Recommendations will improve based on the number of saved articles you have. On the web, you can sort recommended articles by those journals you follow. This feature is not currently available on the mobile app. In the Search section, you can use Docphin to search across all available journals including news sites; however, the fields are pretty limited: title, PubMed ID, author, and journal. A search on “heart attack” brought up a somewhat random list of articles with an ABC news piece from 1.5 years ago at the top of the list. The search is not recommended as a comprehensive way to find research articles, but may help you locate something that you saw previously on Medstream . Alerts allow you to see new articles on topics of interest, either from within the journals you follow or across all journals. Similar to the search function, the options are basic: keywords in the title for all Docphin users; premium subscribers can also get alerts on authors. The Saved articles section shows you any articles you starred. You can create folders, sort, and move citations easily. Note that Docphin is saving the citation information only and that the PDFs reside either in Dropbox, if you put them there, or on the web, accessible through your institutional access. A limitation here is that articles saved to Dropbox using Docphin are not tied to your Saved items within Docphin. And finally, under CME, premium users ($14.95/month) can earn CME credits. Other services for premium users include creating author alerts, advanced search filters, and turning off ads in the mobile app. Services on the web versus the app differ slightly. Accessing Docphin on the web allows for integration with Evernote: you can select to read an article later and it will appear in your Evernote and Docphin Saved items. The web also shows altmetrics scores for citations, and includes videos from The Doctor’s Channel. Free. Premium accounts are $14.95/month. It’s easy to select and follow journals. Institutional access makes getting to PDFs simple. Ability to favorite, email, and save items to Dropbox facilitates better information management. Medstream allows for serendipitous discovery of trending articles. 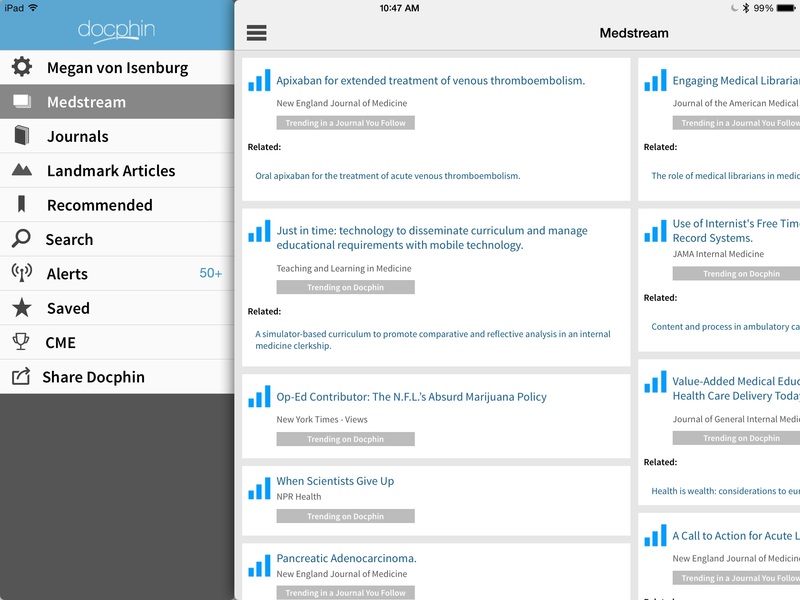 Some of the Medstream articles really won’t be of interest, and they crowd out the journals and topics you selected. Saving articles is somewhat confusing as the citations can be saved in Docphin but PDFs reside elsewhere. The search function is poor. This is a great solution for following journals and topics. 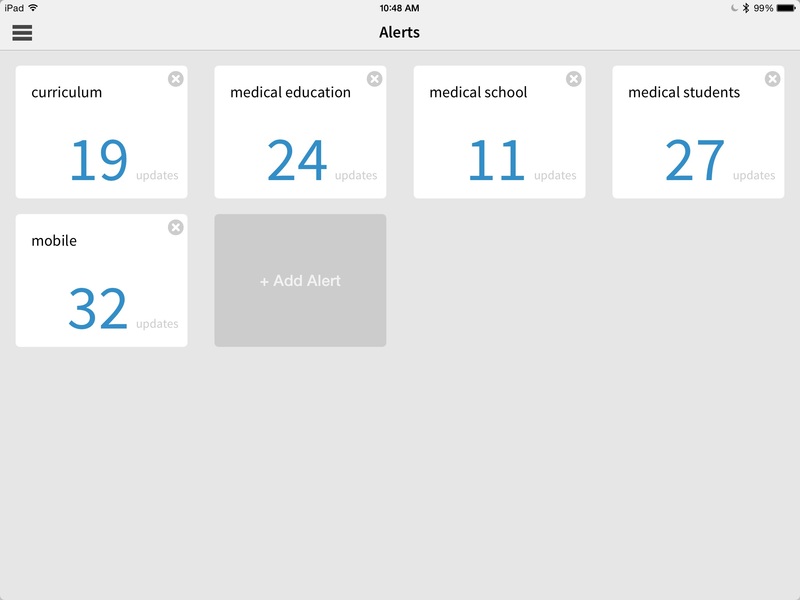 You still have to open your app, but once you do, with a few clicks you can scan the contents from multiple journals and alerts. Medstream adds a component of serendipitous discovery of trending articles. Basic saving functionality and Dropbox integration helps keep important items in your digital brain. Easy to select and find articles of interest. Premium pricing is hefty at $14.95/month. Fortunately, most people won’t need to go Premium to benefit from using Docphin. 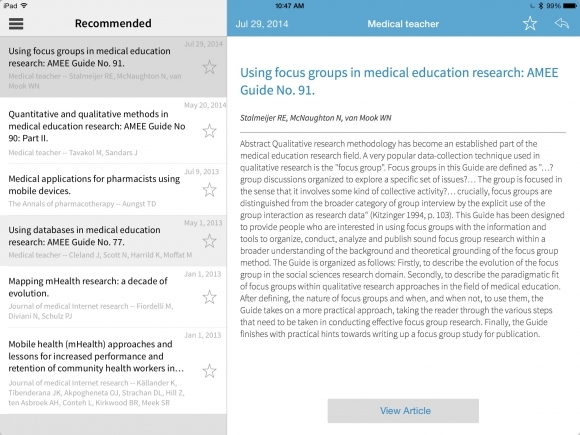 This is a great solution for following journals and topics.